Hand embroidered design on a Lucerne orphrey, made of Cotton, Rayon, Silk and Lurex. Lightweight Brent poly base. Collar is made of the Lucerne material. Blue lucerne compliments the metallic gold and art silk hand embroidery. 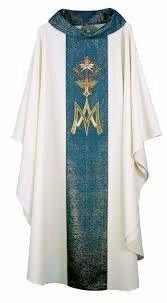 All mds chasubles come complete with an inside stole. 58″ Wide x 52″ Long. Custom sizes, design changes available. Dry Clean only. Made in U.S.A.
Stoles, Dalmatics, Cope, banners and Altar hangings available in this design.